This is the penultimate post following about characters and characteristics. The relationships between characters is a pivot on which actions and status for those individuals are in balance. They can colour the other elements of a character through their state or even be a key attribute (think of new-found lovers and how involved they can be) at a certain point in the story. Like all other elements, it conveys details about the individuals involved that may change in the course of a story arc. These relationships may themseves change (mutable) or not (durable) and can be informed by attributes, driven by motive, drawn from emotional states or informed from inferences from these other elements. In terms of dynamics, they can push some incredible iconography; Romeo and Juliet, Samson and Delilah, Han and Chewie (OK the last one is a business partnership but you get the idea) - these provide strong hooks for a story. 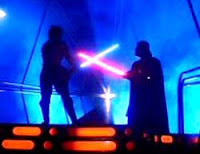 If the relationship is still active (likely a mutable relationship if all parties involved are in the story - consider Luke Skywalker and Darth Vader in the Star Wars cycle) or not (more likely to be durable unless one party undergoes significant change by catharsis or revelation to find a new durability) it can drive the story and alter participants. These too may be relative to the character - a conquering hero can be perceived as a tyrant by those who they have conquered; to those the hero professes loyalty to it's a different matter; or no essential difference between the two sides. The classic example is Coriolanus, his indifference to politics leads him into conflict with his enemies, allies and even his own family. Speaking of relative values; the medieval knight sees things very differently to a modern soldier yet they swear the same duty to a national leader. The feudal samurai has different values and is honour-bound to slay those who dishonour his daimyo or chasten those who disdain his duty. The Mafia wise-guy has a different approach to a Jamaican yardie and to an East End gangster, what is acceptable and what is not means very different things.